The online application building space is one that is getting more interesting by the week. We have previously reviewed a number of apps in this space (sometimes referred to as the ‘online access’ space, a reference to Microsoft Access) including Dabble DB, Zoho Creator and WyaWorks. The premise of these web applications is that they allow non-programmers to easily build record-driven web-based applications. Today a new entrant has entered the space as Coghead announced the public launch of their visual app building service. Coghead promises many of the things that the other applications do – the ability to easily create, access and share applications. The primary use of these products is to create business applications that deal with everything from task tracking through to purchase orders. CogHead comes loaded with a set of ‘starter applications’ such as a simple CRM, an issue tracker and recruitment management. These starter templates can then be edited and further refined by the user to suit their particular needs. What is special about CogHead is that users building applications with the product require less technical skills because the process is all drag-and-drop and visual. CogHead is unique because of just how easy it is to create forms, views and apps – the design view allows users to create fields by dragging and dropping them onto a form. The user can lay the fields out and place them on the page, making the application they build more user friendly and easier on the eyes. Building the logic behind the forms is also a graphical process, the user takes objects and actions and drags them into a flow chart that is similar to a data-flow or logic diagram (see their screenshots). CogHead has a large set of user actions and events available meaning that a very broad range of custom apps can be built. Data can also be processed without a user making a direct action as there are events such as when data is imported etc. 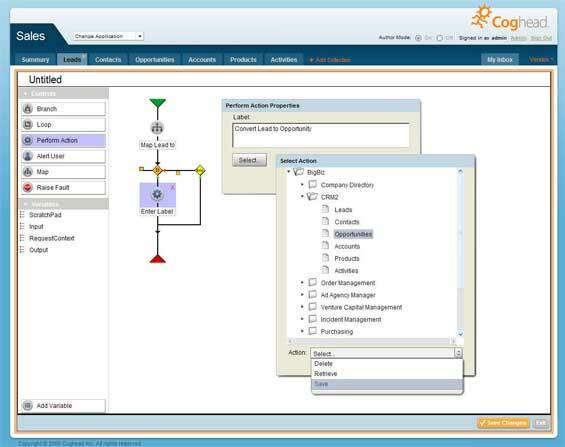 Coghead has a unique and very visual user interface which lets tech-savvy, yet non-coders, easily add business logic to create or modify applications. Coghead says the sweet spot for their product is between packaged software solutions and custom programming, a market that is very large and one that has not yet been fully addressed. Both Visual Basic and Microsoft Access were very popular application development environments, and if you look inside most businesses today you are likely to find some form of custom application developed with one of these Microsoft products. Currently there is no web equivalent of either of these apps, but as the trend towards web-based apps grows there will also be a growing demand to do for web apps what Visual Basic and Access did for desktop apps. To get to this point though the crop of products in the web-based space will need to improve a lot – for instance the applications can not be customized far enough in terms of look and feel and none of them produce apps that are as easy to use, learn and navigate as their custom built brethren are. This space is developing rapidly and I am sure that we will see these apps evolve further very quickly. CogHead is a great product that is pushing this market further forward making it very interesting, certainly a space to keep an eye on and a set of products that will one day be used by almost all businesses. For more reviews of Coghead, see these early posts (while Coghead was still in beta) by Om Malik and Erick Schonfeld.